This crossbow scope from Hawke is designed to be easy to use, and to help improve the accuracy of your shots. It comes with a wide angle lens that allows you to clearly see distant targets, and since it is also fully multi-coated every image is crisp and bright. The scope also comes with a lightweight and durable construction that won’t throw off the balance of your bow. Even though this is not the most advanced crossbow scope on the market, it is still hard to find any serious flaws with it. Some consumers have noted that this scope can be difficult to return if problems occur, and while issues with performance are rare not being able to easily send it back might be something you want to think about. One of the most important aspects of a crossbow scope is the optics. This will determine how visible the target appears, and it will also affect its range. Hawke has designed this black crossbow scope to help you make consistently accurate shots out in the field. The 3 x 32 magnification ensures that distant targets appear like they are standing close enough for you to touch, and will also show exactly where you need to send your arrow. The lens is fully multi-coated to allow maximum light through, and this also helps to prevent moisture from interfering with your view. Since you have plenty of light with the coated lens, all of the details on the target will appear crisp and clear. The wide angle view at 100 yards allows you to clearly see the area, along with any targets that might wander into range. This crossbow scope from Hawke is designed to take a beating and still hold zero, which is always an advantage when you don’t have time to reset it. The sturdy construction can withstand the rigors of hunting in almost any weather, and it is still lightweight enough to easily mount on almost any crossbow. 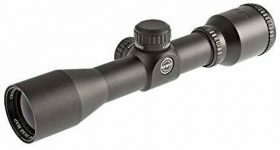 Weighing well under one pound this scope won’t add any noticeable weight to the crossbow so you don’t have to worry about it interfering with balance or stability. When you are out in the field the last thing you want to worry about is setting a scope, and this is not a problem with the MAP from Hawke. Once the scope is set it will hold at zero through some of the most strenuous hunting conditions, and it is incredibly easy to adjust even when you are up in a tree stand. There are two turrets that will make the necessary adjustments for wind and elevation so you know exactly where you need to point the bow. You also don’t need any additional tools, simply turn the turrets with your fingers. The reticle and magnification are fixed on the scope, but this doesn’t mean that it won’t work on your crossbow. Hawke has included innovative software that will accurately calculate the best trajectory for an accurate shot. Simply input the data at the website and the software will perform all of the necessary calculations. Print out the small label and attach it to the lens cover so you will always know which distance marker you need to set the scope to. It is quick and easy, so all you have to do is concentrate on hitting the target when you are in the field. Hawke has designed this crossbow scope to be convenient and easy to use, and it also comes with impressive optics. The software for the ballistics is incredibly accurate with arrows at any speed, which means you can use the MAP scope with any crossbow. 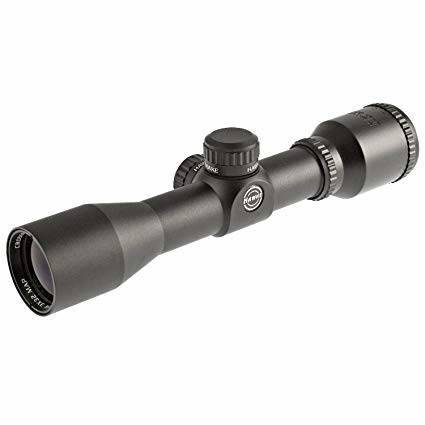 Lightweight, durable, and easy to mount, this scope will make it easier for you to consistently hit distant targets.